(1 p.m. BST) -- While most of the Northern Hemisphere is beginning to emerge from winter, life above the Arctic Circle is still very much snow-covered in early April. 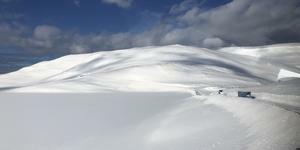 Drifts lie six feet deep, the mountains are powder-white and lakes are frozen solid. Tromso, often billed as the gateway to the Arctic, is the biggest town towards the top of Norway and one of the main stops on the Norwegian Coastal Voyage, as pioneered by Hurtigruten for the past 150 or so years. Come rain or shine, snow or storm, these ships ply the coast every day, from Bergen to Kirkenes, stopping at 34 places along the way, and often passing others in the fleet, sounding their horn as they cross paths. They provide a vital lifeline to the tiny villages that dot this part of the coast, as well as a stunning experience for people who want to experience a cruise like no other. We got on one of the line's coastal voyage ships, (as opposed to its Explorer fleet, which do double duty in Greenland, Iceland and Antarctica), MS Nordkapp, to make the short journey from Tromso to Kirkenes and back. 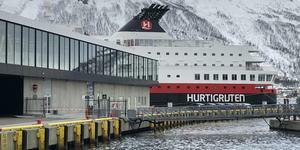 MS Nordkapp is one of Hurtigruten's older vessels (1996), which carries 590 passengers in 214 cabins and suites. It had a significant refurb in 2016, and is looking good on it, with all the public spaces given a clean, fresh, Nordic look and the cabins on the upper decks got new carpets, new upholstery, decor, curtains and TVs. The ship is small, with just six passenger decks, main dining room, one specialty restaurant, a bistro and a lounge. In terms of activities, there are two hot tubs, a sauna and a small gym. But you really don’t need any more as you are stopping every few hours, doing excursions, and then coming back to have hearty meals. Plus, the views of the mountains, the fjords and tiny fishing villages means you spend your whole time while the ship is sailing just staring out the windows. Apart from the personal, friendly and knowledgeable service, the stand out for us was the food. Often caught from the sea surrounding one of the fishing villages the ship has visited just that morning -- this is hyper local and ultra-fresh cooking at its finest. If you ate in the MDR for the whole voyage you would not be disappointed. Every voyage there is a seafood buffet, as well as an a la carte with outstanding beef (the menu gives details on the farm where the cow is raised), carved and presented by the chef as you watch. 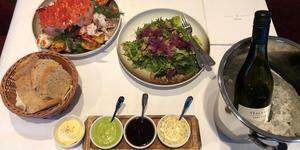 But if you do opt to upgrade (and there is a special offer available on all trips for 245 NOK ($28/£22), you can enjoy some of the finest food we have tasted at sea at Kysten Fine Dining, which would not be out of place at a Michelin-starred restaurant on land. The highlight is the King Crab Night, which is prepared for you table side with a salad, an outstanding scallop starter and wine pairing. And if you want to know where your King Crab lived, who caught it and when, simply scan the QR code on its shell and you will learn all about it. There are plenty of shore excursions you can take part in, ranging in their effort levels (Hurtigruten classifies them one to four in terms of effort and gives a detailed description of each one). We opted for a visit to the North Cape (Level 1) and a snowmobile safari (Level 3). North Cape: The trip to the North Cape would be easy for any level -- it's a coach ride and a wander around the most northerly part of continental Europe. There is a globe sculpture and a cafe and an atmospheric underground area with a chapel (the most northerly in Europe), an exhibition detailing the battles this part of the coast saw in the Second World War, as well as a rather random Thai Museum, celebrating the visit of a Thai king here in 1905! There is also an eerie light show. Perhaps the funnest part was getting there -- you have to go in a fast convoy behind a snow plough that leaves just three times a day. At this time of year, the snowfall is not not so bad, but in mid-winter this section is treacherous and if you miss the slot, that's it, you can't go. We had perfect cold sunny weather, but most of the time it blows a gale. Snowmobile Safari: Don't expect to sit on the back and be driven -- oh no -- you have a (very) quick lesson and you're off, in convoy following the guide! This can be daunting for some, and the snow mobile is heavy to manoeuver, but it's automatic and once you get the hang of it and you are following the tracks of the guide, you gain in confidence and can begin to enjoy the experience. The coolest thing by far is like on a river cruise, you "race" the ship -- so you get off in one port and meet the ship in another. We loved that. It's about an hour long and exhilarating, though tiring (on the arms). Hurtigruten also has an option to do a night time one, but there were not enough people signed up, so we did a dusk one. Forget four seasons in a day -- this is four seasons in an hour. You can be on deck gazing out at the scenery, the brilliant sunshine on your face, when suddenly the sky will darken and a snowstorm will start up, or hail, or a gale. We had pretty choppy seas headed north, which calmed to a mill pond on the southbound stretch. There is no way of telling how the seas will be this far north, though travel in the summer months will be calmer (though you're not having the same experience of course). The best time to see the Northern Lights is at the autumn or spring equinoxes, so we did not have high hopes. However, there is still a strong chance when you are this far north and there is still darkness in the evening sky, to get a glimpse of this stunning phenomenon. Every evening, the expedition leaders give a lecture, often on the place the ship is next calling in at, some tips and advice on what to see, shore excursion details and Northern Lights predictions for that evening. As we pulled into Tromso, an announcement came over the PA: "Northern Lights on the starboard bow." And so we rushed up, and we caught them -- quite faint, but still distinct, shooting over the mountains surrounding the town in long ribbons or threads. It was a wonderful -- and unexpected -- ending to a memorable voyage. Find out when and where to see the Northern Lights.